Restoration of decorative paint finishes. Photo: Sara B. Chase. The paint Americans used in the past is undeniably part of a technological and commercial record. But beyond that, the colors we have chosen and continue to select for our interior living and working spaces—bright and exuberant, purposefully somber, or a combination of hues—reflect our nation's cultural influences and our individual and collective spirit. Paint color is a simple, direct expression of the time, and of taste, values, and mood. To consider paint only as a protective coating is to misunderstand its meaning as an important aspect of America's heritage. Researching the interior paint history is the key to a successful preservation or restoration project. 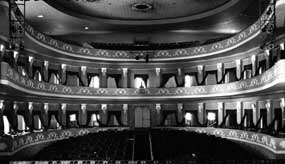 The decorative detailing can be appreciated in this Puerto Rico Theater primarily because of appropriate paint color and paint placement. Photo: Max Toro. This Brief is about historic interior paints and choosing new paints for historic interiors if repainting is necessary or desirable. It addresses a variety of materials and features: plaster walls and ceilings; wooden doors, molding, and trim; and metal items such as radiators and railings. It provides background information about some of the types of paint which were used in the past, discusses the more common causes and effects of interior paint failure, and explains the principal factors guiding decisions about repainting, including what level of paint investigation may be appropriate. Careful thought should be given to each interior paint project, depending on the history of the building and its painted surfaces. Treatments may range from protecting extant decorative surfaces, to ordering custommade paint that replicates the original paint color, to using today's paint straight off the shelf and out of the can. Finally, stripping old paints or applying new oil/alkyd paints poses serious health and safety concerns; the State Historic Preservation Officer should be contacted for current legal and technical information on removal, disposal, and health and safety precautions. Paint is a dispersion of small solid particles, usually crystalline, in a liquid medium. Applied to a surface, this liquid has the special quality of becoming a solid, protective film when it dries. Paint also enhances the appearance of surfaces. A late Victorian writer observed that the coming of a painter to a house was cause for celebration. Indeed, these statements not only indicate the chemical and physical complexity of paint, but also its emotional impact. 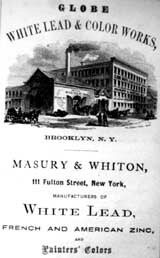 There were numerous companies producing white lead in the United States by mid-19th century. Shown is one manufacturer's flyer. Photo: NPS files. Pigment made the paint opaque, thus preventing deterioration of the substrate caused by ultraviolet light, and added color, thus making the paint attractive. White lead, a whitish corrosion product of lead, was most often used to provide opacity. The white pigment in a colored paint is often called the "hiding" pigment. In addition to preventing the sun's damaging rays from hitting the surface of the substrate, the white lead also helped prevent the growth of mold and mildew. Not until early in the 20th century was a successful substitute, titanium dioxide (TiO2), patented, and even then, it did not come into prevalent use by itself until the mid-20th century (earlier in the century, titanium oxide and white lead were often mixed). Zinc oxide was used briefly as a hiding pigment after 1850. Early tinting pigments for house paints consisted of the earth pigments—ochres, siennas, umbers made from iron-oxide containing clay—and a few synthesized colorants such as Prussian blue, or mercuric sulfide (crimson). From the early 1800s on more pigments were developed and used to offer a wider and brighter variety of hues. The most common binder in interior paints was, and still is, oil. Chalk was sometimes added to waterbased paints to help bind the pigment particles together. Other common binders included hide glue and gelatin. The fluid component was termed the vehicle, or medium, because it carried the pigment. Historically, vehicles included turpentine in oil paints and water in waterbased paints, but other vehicles were sometimes used, such as milk in casein paints. The two major types of paint are termed oil-based and water-based. For oilbased paints, linseed oil was frequently chosen because it is a drying oil. When thinned with an organic solvent such as turpentine for easier spreading, its drying speed was enhanced. To make the drying even faster, drying agents such as cobalt compounds were frequently added. Because the addition of driers was most successfully done in hot or boiling oil, boiled linseed oil was preferable. The drying rate of linseed oil paints was relatively rapid at first, for several days immediately after application, and paint soon felt dry to the touch; it is important to remember, however, that linseed oil paint continues to dry—or more precisely, to crosslink—over decades and thus continues to a point of brittleness as the paint ages. Strong and durable with a surface sheen, oil-based paints were mainly used for wood trim and metal. Whitewashes and distemper paints differed from oil paints in appearance primarily because the vehicle was water. Waterbased paints were always flat, having no gloss of their own. Because the paint film dried to the touch as soon as the water evaporated, driers were not needed. Waterbase paints were fairly strong, with the pigments well bound as in hide glue distempers, but they did not hold up to abrasion. Wood trim, therefore, was rarely painted with these types of paint historically, though interior plaster surfaces were frequently coated with whitewash and calcimine. Distemper paints were commonly used for decorative work. Until the mid-20th century, almost all paints used in America could be divided according to the type of binder each had. Chemists sought to improve paints, especially when the two world wars made traditional paint components scarce and expensive. Modern paints are far more complex chemically and physically than early paints. More ingredients have been added to the simple threepart system of pigment, binder, and vehicle. Fillers or extenders such as clay and chalk were put in to make oil paints flow better and to make them cheaper as well. Mildewcides and fungicides were prevalent and popular until their environmental hazards were seen to outweigh their benefits. New formulations which retard the growth of the mildew and fungi are being used. As noted, lead was eliminated after 1950. Most recently, volatile organic solvents in oil paint and thinners have been categorized as environmentally hazardous. A major difference in modern paints is the change in binder from the use of natural boiled linseed oil to an alkyd oil which is generally derived from soybean or safflower oil. Use of synthetic resins, such as acrylics and epoxies, has become prevalent in paint manufacture in the last 30 years or so. Acrylic resin emulsions in latex paints, with water thinners, have also become common. Historic paints were often made with what was available, rather than adhering to strict formulas. Recipes for successful formulas can be found in historic documents, such as newspapers, illustrating the combinations of ingredients which could be used to produce a paint. Oil-based paints: Linseed oil, a volatile thinner such as turpentine; a hiding pigment (usually white lead) and coloring pigments. Enamels: natural resin varnish was added to oil-based paint to provide a hard, more glossy surface. Glaze: a translucent layer applied to protect the paint and to impart a more uniform gloss surface. Usually made from linseed oil with natural resin varnish added. Some glazes have small quantities of tinting pigments such as verdigris or Prussian blue; some had no pigments added. Water-based paints: Water, pigment, and a binder, such as hide glue, other natural glues, or gums. Usually used on interior plaster surfaces. Whitewash: often used on interior plaster surfaces in utilitarian spaces and, at times, used on interior beams; consisted of water, slaked lime, salt, and a variety of other materials. Occasionally a pigment (usually an ochre or other earth pigment) was added to provide tint or color. Distemper: used for interior applications, were made from water, glues (one or more different natural glues, gelatine, and gums) with whiting as the basic white pigment to which other tinting pigments were added. Calcimine, or kalsomine: often used on interior surfaces and is another common name for distemper. Tempera: paint prepared with pigment, egg yolk or white and water; used almost exclusively for decorative treatments. Gouache: a waterbased paint made of whiting, pigment, water, and gum arabic as the binder; used almost exclusively for decorative treatments. Casein: also called milk paint, was made with hydrated (slaked) lime, pigment, and milk. Most often oil was added, making a strong emulsion paint. Various recipes call for a large variety of additives to increase durability. Casein paints were also used for exterior surfaces. How were paints made prior to the widespread use of factory-made paint after 1875? How did they look? The answers to these questions are provided more to underscore the differences between early paints and today's paints than for practical purposes. Duplicating the composition and appearance of historic paints, including the unevenness of color, the irregularity of surface texture, the depth provided by a glaze top coat, and the directional lines of application, can be extremely challenging to a contemporary painter who is using modern materials. 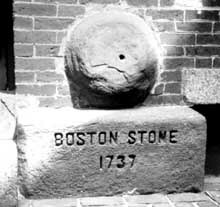 The Boston Stone (1737), a surviving relic of early paint production, was used for pigment grinding in the shop of Thomas Child of Boston, a London-trained painter and stainer. Photo: Courtesy, SPNEA. The pigments used in early paints were coarsely and unevenly ground, and they were dispersed in the paint medium by hand; thus, there is a subtle unevenness of color across the surface of many pre-1875 paints. The dry pigments had to be ground in oil to form a paste and the paste had to be successively thinned with more oil and turpentine before the paint was ready for application. The thickness of the oil medium produced the shiny surface desired in the 18th century. In combination with the cylindrical (or round) shaped brushes with wood handles and boar bristles, it also produced a paint film with a surface texture of brush strokes. The early churches and missions built by the French in Canada and the Spanish in the southwestern United States often had painted decoration on whitewashed plaster walls, done with early waterbased paints. By the mid-17th century oil paint was applied to wood trim in many New England houses, and whitewash was applied to walls. These two types of paint, one capable of highly decorative effects such as imitating marble or expensive wood and the other cheap to make and relatively easy to apply, brightened and enhanced American interiors. In cities such as Boston, Philadelphia, New York, and later, Washington, painters and stainers who were trained guildsmen from England practiced their craft and instructed apprentices. The painter's palette of colors included black and white and grays, buffs and tans, ochre yellows and iron oxide reds, and greens (from copper compounds) as well as Prussian blue. That such painting was valued and that a glossy appearance on wood was important are substantiated by evidence of clear and tinted glazes which may be found by microscopic examination. Early paints did not dry out to a flat level surface. Leveling, in fact, was a property of paint that was much sought after later, but until well into the 19th century, oil paints and whitewashes showed the signs of brush marks. Application therefore was a matter of stroking the brush in the right direction for the best appearance. The rule of thumb was to draw the brush in its final stokes in the direction of the grain of the wood. Raisedfield paneling, then, required that the painter first cover the surface with paint and afterward draw the brush carefully along the vertical areas from bottom to top and along the top and bottom bevels of the panel horizontally from one side to the other. In the 19th and early 20th centuries, for very fine finishes, several coats were applied with each coat being rubbed down with rotten stone or pumice after drying. A four to five coat application was typical; however nine coats were not uncommon at the end of the century for finishes in some of the grand mansions. Generally, they were given a final glaze finish. Though expensive, this type of finish would last for decades and give a rich, smooth appearance. Color matching is complicated by the fact that all early paints were made by hand. Each batch of paint, made by painters using books of paint "recipes" or using their own experience and instincts, might well have slight variations in color—a little darker or lighter, a little bluer and so on. The earliest known book of paint formulations by an American painter is the 1812 guide by Hezekiah Reynolds. It gives instructions for the relative quantities of tinting pigments to be added to a base, but even with proportions held constant, the amount of mixing, or dispersion, varied from workman to workman and resulted in color variations. Knowing all of the facts about early paints can aid in microscopic paint study. For example, finding very finely and evenly ground pigments, equally dispersed throughout the ground or vehicle, is an immediate clue that the paint was not made by hand but, rather, in a factory. By the first decades of the 19th century more synthetic pigments were available—chrome yellow, chrome green, and shades of red. Discoveries of light, bright, clear colors in the plaster and mosaic decoration of dwellings at Pompeii caught the fancy of many Americans and came together with the technology of paint to make for a new palette of choice, with more delicacy than many of the somewhat greyeddown colors of the 18th century. Of course, the blues which could be produced with Prussian blue in the 18th and 19th centuries were originally often strong in hue. That pigment—as were a number of others— is fugitive, that is, it faded fairly quickly and thus softened in appearance. It should be remembered that high style houses from the mid-17th to late 19th centuries often had wallpaper rather than paint on the walls of the important rooms and hallways. Another paint innovation of the early 19th century was the use of flatter oil paints achieved by adding more turpentine to the oil, which thus both thinned and flatted them. By the 1830s the velvety look of flat paint was popular. Unfortunately, flat paints attract dirt, which is less likely to adhere to high gloss surfaces, and are thus harder to wash. Victorians tended to use high gloss clear (or tinted) finishes such as varnish or shellac on much of their wood trim and to use flat or oil paints on walls and ceilings. The task of preserving or restoring decorative work, such as the complex stencilling shown here, should only be undertaken by professionals who have specialized training. Photo: Alexis Elza. In interiors, paint could be used creatively and imaginatively, most often to decorate rather than to protect. Decorative forms included stencilling, graining and marbleizing, and trompe l'oeil. Stencilling. Stencilled designs on walls were often used in the first half of the 19th century in place of wallpaper. Old Sturbridge Village, in Massachusetts, has paintings showing the interiors of a (c. 1815-1820) farmhouse which has both stencilled walls—imitating wallpaper—and painted floors or oiled and painted floor cloths, imitating fine carpets. By 1850 and for the next 60 years thereafter, stencilled and freehandpainted decoration for walls and ceilings became a high as well as a humble art. Owen Jones' Grammar of Ornament, published in 1859, provided the source for painted decoration from Portland to Peoria, Savannah to San Francisco. 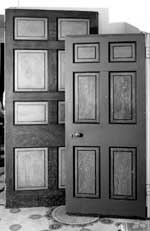 Historic doors may have graining patterns or clear finishes under one or several coats of plain paint, such as these restored 18th and 19th century doors. Photo: Jack E. Boucher, HABS, NPS. If floors, walls, and ceilings were decorated by paint in a variety of styles, the wood and stone trim of rooms was not omitted. The use of faux bois, that is, painting a plain or common wood such as pine to look like mahogany or some finer wood, or faux marbre, painting a wood or plaster surface to look like marble—realistically or fantastically—was common in larger homes of the 18th century. By the early 19th century, both stylized graining and marbleizing adorned the simple rural or small town houses as well. Often baseboards and stair risers were marbleized as were fireplace surrounds. Plain slate was painted to look like fine Italian marble. In many simple buildings, and, later, in the Victorian period, many prominent buildings such as town halls and churches, the wood trim was given a realistic graining to resemble quarter sawn oak, walnut, or a host of other exotic woods. Churches, courthouses, and state capitols frequently received yet another remarkable use of paint: trompe l'oeil decoration. Applied by skilled artists and artisans, painted designs—most often using distemper paints or oils—could replicate threedimensional architectural detailing such as ornate molded plaster moldings, medallions, panels, and more. An enormous growth of the paint industry began in the 1860s, stimulated by the invention of a suitable marketing container—the paint can. The first factory-made paints in cans consisted of more finely ground pigments in an oil base; after purchase, additional oil was added to the contents of the can to make up the paint. Such paints saved the time of handgrinding pigments, and were discussed at length by John Masury in his numerous books. After 1875, factory-made paints were available at a reasonable cost and, as a result, greater numbers of people painted and decorated more of their buildings, and more frequently. The new commercial market created by ready-mixed paint became the cornerstone of our modern paint industry. By the early decades of the 20th century, popular taste turned away from exuberant colors and decoration. Until the late 1920s both the Colonial Revival and Arts and Crafts styles tended toward more subdued colors and, in the case of Colonial Revival, a more limited palette. The use of faux finishes, however, continued. Residential architecture often featured stencilling, such as painted borders above wainscoting or at ceiling and wall edges to imitate decorative wallpaper. Institutional buildings in both cities and small towns used wood graining on metalclad doors, door and window frames, and staircases, and had stencilled ceilings as well. Many high style public buildings of the 1920s had painted ceilings which imitated the Spanish and Italian late medieval and Renaissance styles. 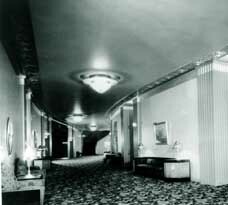 The Art Deco style lobby foyer of the Paramount Theater in Sacramento, California (1931) features painted plaster columns and cornices which have been finished in gold and silver leaf. Photo: Gabriel Moulin Studios. Although stenciling, gilding, and faux finishes can be found, they did not express the modern style of the time. On the other hand, glaze treatments were often used in the early 20th century to "antique" walls and trim that had been painted with neutral colors, especially in Spanish Colonial Revival and Mission architecture. The glazes were applied by ragging, sponging, and other techniques which gave an interesting and uneven surface appearance. Colored plasters were sometimes used, and air brushing employed to give a craftsman-like appearance to walls, trim, and ceilings. During the same period, Williamsburg paint colors were produced and sold to people who wanted their houses to have a "historic Georgian look." Churches, country clubs, and many private buildings adopted the Williamsburg style from the late '20s onward. Often decorated with simple molded plaster designs of the Art Deco and Art Moderne styles, interiors of the 1930s and 1940s were frequently accented with metal flake paints in a full range of metallic colors, from copper to bronze. And enamels, deep but subdued hues, became popular. Paint technology had progressed and varying degrees of gloss were also available, including the mid-range enamels, variously called satin, semigloss, or eggshell. In contrast to Victorian paint treatments, this period was characterized by simplicity. To some extent, the Bauhaus aesthetic influenced taste in the 1950s; interior paints were frequently chosen from a palette limited to a few "earth" colors and a "nearly neutral" palette of off-whites and pale greys. While the trend in colors and decorative treatments was defined by its simplicity, paint chemists were developing paints of increasing complexity. Experimentation had started early in the 20th century and accelerated greatly after World War II. Of greatest significance was the manufacture of the latex paints for consumer use. Synthetic resin emulsions carried in water offered advantages over the traditional oil paints, and even over the oil/alkyd paints: they did not yellow; they permitted water cleanup until dried; and they emitted no toxic or hazardous fumes from solvent evaporation. Understanding each project's historic preservation goal and knowing what level of information needs to be collected to achieve that goal is an important responsibility of the purchaser of the service. Before someone is hired, the owner or manager needs to decide if a thorough investigation of painted surfaces is actually needed, and how to use the results when one is done. This conservator is shown collecting paint samples onsite. Then, in a laboratory, an ultra violet light microscope will be used to identify pigment and binding media. Photo: Courtesy, Matt Mosca. Specialists with both training and field experience conduct paint investigations. These experts use sophisticated instruments and procedures such as field sampling, cross-section analysis, and fluorescent and chemical staining to learn about the components and behaviors of historic paints. In addition, they utilize written documentation, verbal research, and visual information about past painting in the building in conjunction with findings in the field. Paint investigation can make several contributions to a project. A complete analysis of the paint layers on surfaces within a structure can tell a great deal about the sequence of alterations that have occurred within a building, as well as potentially providing ranges of dates for some of these changes. By establishing a full sequence of paint layers (termed a chromochronology), together with other research, alterations of various building spaces and features can be associated with specific paint layers. It is by establishing this association that the correct layer is identified; when the correct layer has been identified, the color may be matched. A dark layer can be seen beneath the flaking paint on these raised field panels. Depending on the project work goal and the period of the building's history being interpreted, any one of the paint layers could be duplicated in repainting. Photo: NPS files. In addition to its archeological value, paint analysis can determine the types and colors of paint on a given surface (identification of thin glazes, decorative paint schemes, binders and pigments). Beyond color identification, then, paint analysis is also recommended to diagnose causes of paint failure. Knowing a paint binder can often explain causes as well as guide appropriate preservation or conservation treatments. Owners and managers should identify all of these needs before deciding on the extent of analysis. For example, a complete paint investigation is usually recommended as part of an historic structure report. For buildings with little documentation, additions and alterations can often be identified, and possibly dated, through analysis. Often the use of such seemingly expensive techniques can save money in the long run when determining the history of building change. It is possible to do some analysis on site; this is a much simpler process that can be undertaken for less cost than the complex laboratory procedures described above. However, the usefulness of onsite analysis is limited and the results will not be as precise as results from samples that are analyzed in a laboratory with a good microscope. Any shortcut approaches to paint analysis that do not follow scientific procedures are generally not worth the expense. In summary, if preservation and restoration treatments are being undertaken, a complete investigation is recommended; for a rehabilitation project, onsite analysis and color matching may provide an adequate palette. Most projects involve repainting. It is the historic appearance of the interior and the visual impression that will be created by new paint treatments that must be considered before choosing a particular course of action. The type and colors of paint obviously depend on the type of building and the use and interpretation of its interior spaces. A consistent approach is best. When the treatment goal is preservation, a building's existing historic features and finishes are maintained and repaired, saving as much of the historic paint as possible. Sometimes, cleaning and washing of painted surfaces is all that is needed. Or a coating may be applied to protect important examples of history or art. If repainting is required, the new paint is matched to existing paint colors using the safer, modern formulations. Recreating earlier surface colors and treatments is not an objective. Interior spaces that are being rehabilitated for a new use can benefit from being repainted in historic period colors rather than a neutral off-white. Photo: NPS files. In a typical rehabilitation, more latitude exists in choosing both the kind of new paint as well as color because the goal is the efficient reuse of interior spaces. Decisions about new paint often weigh factors such as economy and durability—use of a high quality standard paint from a local or national company and application by a qualified contractor. Color choices may be based on paint research reports prepared for interior rooms of comparable date and style. More often, though, current color values and taste are taken into account. Again, the safer paint formulations are used. Interiors of institutional buildings, such as university buildings, city halls, libraries, and churches often contain rich decorative detailing. During rehabilitation, careful choices should be made to retain or restore selected portions of the decorative work as well as match some of the earlier colors to evoke the historic sense of time and place. At the least, it is important to use periodtypical paint color and paint placement. In a restoration project, the goal is to depict the property as it appeared during its period of greatest significance. This may or may not be the time of its original construction. For example, if a building dated from 1900 but historians deemed its significance to be the 1920s, the appropriate paint color match would be the 1920s layer, not the original 1900 layer. Based on historical research, onsite collection of paint samples, and laboratory analysis, surface colors and treatments can be recreated to reflect the property at a particular period of time. It should be noted that scholarly findings may yield a color scheme that is not suited to the taste of the contemporary owner, but is nonetheless historically accurate. In restoration, personal taste in color is not at issue; the evidence should be strictly followed. In the restoration process, colors are custom-matched by professionals to give an accurate representation. 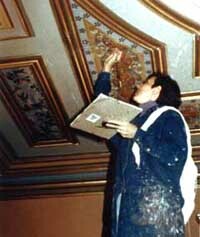 If an artist or artisan can be found, the historically replicated paint may be applied using techniques appropriate to the period of the restoration. Although custom paint manufacture is seldom undertaken, color and glazing are capable of being customized. In some projects, paint may be custom-made using linseed oil and, if building code variances allow it, white lead. For example, the repainting of a number of rooms at Mount Vernon demonstrates that it is possible to replicate historic paints and applications in all aspects; however, as noted, replication of historic paint formulation is not practical for the majority of projects. Because painted surfaces are subject to abrasion, soiling, water damage, sunlight, and application of incompatible paints they generally need to be repainted or at least reglazed appropriately from time to time. From the baseboards up to a level of about six feet off the floor, wood trim is constantly subjected to wear from being touched and inadvertently kicked, and from having furniture pushed against it. Chair rails were in fact intended to take the wear of having chairs pushed back against them instead of against the more delicate plaster wall or expensive wallpaper. Doors in particular, sometimes beautifully grained, receive extensive handling. Baseboards get scraped by various cleaning devices, and the lower rails of windows, as well as window seats, take abuse. The paint in all of these areas tends to become abraded. Two things are important to bear in mind about areas of abraded paint. Samples taken to determine original paint colors and layer sequences will not be accurate except at undamaged edges. Also, dirt and oil or grease need to be removed before applying any new paint because new paint will not adhere to dirty, greasy surfaces. Soiling is another problem of interior paint. Fireplaces smoked; early coalfired furnaces put out oily black soot; gas lights and candles left dark smudges. Sometimes the dirt got deposited on plaster walls or ceilings in a way that makes the pattern of the lath behind the plaster quite clear. Another source of dirt was polluted outside air, from factories or other industries, infiltrating houses and other nearby buildings. Until smokestacks became very high, most air pollution was caused by nearby sources. In paint investigation, dirt on the surface of paint layers; as seen under the microscope, can be very useful in suggesting the length of time a given paint layer remained exposed, and in distinguishing a finish layer from a prime or undercoat layer. This kind of soiling can happen on any painted surface in a room, but may be slightly heavier in the recesses of moldings and on upwardfacing horizontal edges. Using dirt as a sole measure, however, may be misleading if the surfaces have been cleaned. The fracture or bonding between paint layers is often used by professionals as a better means of indicating time differences between layers as well as indicating those layers that are part of a single decoration or painting. Water, the usual source of deterioration for many kinds of material, is also a prime cause of interior paint failure. As a liquid, it can come from roof leaks, from faulty plumbing or steam heating systems, or from firesuppression systems that have misfired. As a vapor, it may come from such human activities as breathing, showering, or cooking. Plaster walls sealed with unpigmented hideglue are notably susceptible to water damage because it forms a watersoluble layer between the plaster and the paint. This can cause the paint to lose adhesion when even small amounts of moisture come into contact with the watersoluble sealer. Finally, in historic interiors, especially where there is heavy paint buildup, paint can weaken and fail due to chemical or mechanical reasons. For example, the older linseed oil is, the more brittle it is. It also darkens when it is covered and gets no ultraviolet exposure. In rooms where there is more sunlight on one area than on others, the oil or even oil/alkyd paint will get discernibly darker in the less exposed areas in as short a time as six months. Painted over, the oil medium in older paints gets quite yellowbrown, thus changing the color of the paint. Prussian blue is one of the tinting pigments that is particularly vulnerable to fading. Understanding some basic differences in the strength of various paints helps to explain certain paint problems. Paints that dry to a stronger film are incompatible with those which are weaker. Acrylic latex paints are stronger than oil/alkyd paints. Oil or oil/alkyd paint is stronger than waterbased paint such as calcimine. When a stronger paint is applied over a weaker paint, it will tend to pull off any weaker paint which may have begun to lose its bond with its substrate. Thus, on many ceilings of older buildings where oil/alkyd paints have been applied over old calcimine, large strips of paint may be peeling. Oil or varnish glazes over older paints become brittle with age, and can make removal of later paints rather easy. Sometimes it is possible to take advantage of this characteristic to reveal an earlier decorative treatment such as graining or marbleizing. Getting under the edge of the glaze with a scalpel blade can make the removal of later paints relatively simple, and relatively harmless to the fancier paint treatment. Sometimes, paints separate from each other simply due to poor surface preparation in the past or the hardening of the earlier surface paint. Use of alkaline paint strippers can cause paint to lose adhesion. When insufficiently neutralized, they leave salts in wood which cause oil or oil/alkyd paints to fail to adhere to the surface. If dirt or oily residues are not cleaned from the surfaces to be painted, new paint will not remain well adhered. First, it is important to note that the earlier, linseed oil-based paints were penetrating type paints, forming a bond by absorption into the substrate. Often these thin oil coatings were slightly tinted with an ironoxide pigment so coverage could be seen; the next coating applied would adhere to this first oil layer. Modern paints, on the other hand, are primarily bonding paints with little ability to penetrate a substrate. For this reason, surface preparation is extremely important for today's paints. Before preparing the interior for repainting, all moisture penetration from failing roofs or gutters or from faulty plumbing or interior heating elements should be identified and corrected. A paint job is only as good as the preparation that goes before it. The surface to be painted, old or new, wood, plaster, masonry, or metal must be made sound and capable of taking the paint to be applied. 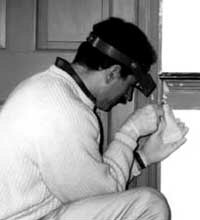 The first step in preparing interior wood and plaster surfaces which are coherent and sound is to remove any loose paint (see Paint Hazards sidebar). Careful hand scraping is always advisable for historic surfaces. Use of mechanical sanders usually leaves traces of the sander's edges, visible through the new paint film. Hand sanding is also necessary to feather the edges of the firmly adhering layers down to the bare areas so that shadow lines are avoided. Preparing previously painted interior masonry for new paint is basically similar to preparing plaster. Metals elements, such as radiators, valences, or firebacks are somewhat different. In order to get a sound paint job on metal items, the work is primarily that of sanding to remove any rust before repainting. If the existing paint is well adhered over the entire metal surface, then it may be necessary only to sand lightly to roughen the existing paint, thus providing some "tooth" for the primer and new paint layer. On wood, garnet sanding papers work well. Aluminum oxide and silicon carbide sandpapers are effective on other surfaces as well as wood; emery papers should be used on metals. When should surfaces be completely stripped? Obviously, new paint is wasted when applied on old paint which is loose, that is, extensively damaged and deteriorated. Sometimes paint on an architectural feature needs to be removed if it obscures delicate detailing. For the most part, however, if the surface is intact—and the presence of lead paint has been shown to present no health dangers to building occupants—the existing paint can be overpainted. Well-adhered, intact paint layers (in at least one area of each room) should be covered with a sturdy protective tape, then painted over with the new paint and left in place to inform future research. The next owner may be interested in the building's past history, and methods of gleaning information from old paints grow more sophisticated all the time. Propane torches should never be used because they can damage historic wood features. Also, charred areas of wood will not hold the new paint. Use of a heat gun or heat plate may be relatively fast, but has both health and safety drawbacks. 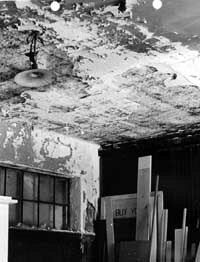 Heat oxidizes lead paint, causing poisonous fumes. And old walls may contain fine debris which acts like tinder and smolders when heated, bursting into flame hours after the stripping. (Heat methods are best limited to those interior elements that can be safely removed from the building for stripping and reinstalled). 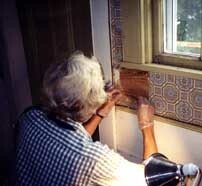 Finally, scraping to remove heatloosened paint may gouge and scar the wood or plaster substrate if not done carefully. Rotary wire brushes cut into wood and should be avoided altogether. Removing paint from wood and plaster features can be done with either caustic strippers (potassium or sodium hydroxide) or solvent strippers (organic compounds such as methylene chloride, methanol, or toluol). Caustic strippers are fairly fast acting, but can weaken wood fibers if left on too long, causing them to raise and separate. They also leave alkaline residues which must be neutralized by an acidic wash (usually white vinegar which contains 4% acetic acid). It is difficult to make the neutralizing 100% effective and, when it is not, chemical reactions between the alkaline residues and the new paint may cause the paint to lose adhesion. Methylene chloride and other organic compounds are as effective as caustic strippers, but their fumes may be both flammable and toxic. While they may leave wood and plaster surfaces free from harmful residue, the newly cleaned surface must be washed down with mineral spirits or denatured alcohol before priming in order to remove additives, such as wax, that were put in the stripper to retard its drying. All hazard warnings on the labels of chemical strippers should be heeded. Waterbased paints can usually be scrubbed off with hot water with a detergent added. Calcimine and whitewash are difficult to remove; because of the lime or whiting content (calcium carbonate), however, they can be broken down with acids. While strong acids may work quickly, they are very dangerous. Acetic acid in its most common form, vinegar, (4% acetic acid) is often used instead. In areas where any calcimine remains and is evident as chalk, the area can be coated with white shellac, which provides a stable surface for the new paint. Air pressure of 200-500 psi is effective for flat surfaces if there is a weak substrate surface bond. A flat nozzle is inserted between the paint layer and substrate, and the air pressure simply lifts the loose paint up for easy removal. When used carefully, this method is fast and causes little damage. Once the substrate and its surface are sound and clean, free from crumbling, loose material or dust, the next step is to undercut and fill any cracks in plaster surfaces. Plaster which has lost its key and is sagging should be reattached or replaced. Friable plaster and punky wood need to be consolidated. Wood surfaces should be made as smooth as they were historically so that the paint film will cover a relatively uniform surface. Rotted wood must be removed and new wood carefully spliced in. Finally, gypsum plaster finishes can be painted as soon as the water has evaporated; a lime putty coat or traditional finish plaster can be primed almost immediately after drying as well, using alkaliresistant primers such as acrylic latex. The importance of a primer can hardly be overstated. It is the intermediary material between the immediate substrate, which may be an old paint layer or may be bare wood, plaster, or metal (rarely stone, as around a fireplace opening), and the fresh paint itself. The primer must be capable of being absorbed to some extent by the material underneath while being compatible and cohesive with the paint to be applied on top. Most paint manufacturers will provide explicit instructions about which primers are most compatible with their paints. Those instructions should be followed. The question of a primer for latex paint continues to be debated. Traditionalists recommend that the primer between an old oil paint and a new latex paint be an oil primer, but the improvements to latex paint in recent years have led many experts to the conclusion that today's top grade latex primers are best for latex finish paints. If a latex primer is selected, the label on the can should specify clearly that it is one which can bond to an older oil or oil/alkyd paint. The most important general rule to remember is that softer or weaker paints should always go over harder and stronger paints. For instance, because latex is stronger than oil, an oil or oil/alkyd paint can go over a well adhered latex, but the reverse will run the risk of failure. Using primer and finish paints by a single company is a good way to guarantee compatibility. Most frequently today, the project goal is preservation or rehabilitation. Because of the impracticality of replicating historic paints, restoration is least often undertaken. Given current laws restricting the use of toxic ingredients, such as lead, solvents, and thinners, contemporary substitute paints using safer ingredients need to be used. Many paint companies make latex paints in colors that are close to historic colors as well as appropriate gloss levels, but contain no white lead and no hazardous volatile organic compounds. Work on historic properties generally requires the services of a qualified paint contractor who has had at least five years of experience and who can list comparable jobs that a potential client can see. Then, too, getting a sample or a mockup of any special work may be advisable before the job starts. While less experienced workers may be acceptable for preparing and priming, it is wise to have the most experienced painters on the finish work. Today's version of oil paint has a binder that usually contains some linseed oil (read the paint can label), but also has one of the improved synthesized oils, frequently soybased, known as alkyds. They dry hard, have flexibility, and discolor far less than linseed oil. They can also be manufactured to dry with a high sheen, and can take enough tinting pigment to create even the very deep Victorian period colors. However, they all contain volatile organic compounds, and thus are forbidden by law in some parts of the United States. They are also less simple and more dangerous to use, as cleaning up involves mineral spirits. Traditional water-based paint and artists' brushes are being used to reproduce historic finishes within a restoration project. Photo: Courtesy, Alexis Elza. Latex paints are synthetic resins carried in water. Before the paint dries or crosslinks, it can be cleaned up with water. Early in the history of latex paints, some contained styrene/butadiene resins. Now nearly all topgrade latex paints contain acrylic resins, which are superior. Also, until fairly recently, the latex paints, while offering great strength, quick drying, and water cleanup, had some disadvantages for jobs which needed to have an historic look. Today, there are latex product lines with better gloss characteristics and more historic colors from which to choose. In addition, latex paints often have excellent color retention with very little fading. Still, it is always a good idea to buy a quart and "test paint" the color chosen for the job on site before making a total commitment. Modern waterbased paints such as calcimine can be purchased today and have much the same appearance as the early ones. The same is true of modern whitewash, although today's whitewashes do not leave the same ropy surface texture as the early ones. Glazes were often part of historic paint treatments. Traditionally oil and turpentine, sometimes with a scant amount of pigment, today's glazes can be formulated with a water base and are relatively simple to apply by brush. An experienced decorative painter should be consulted before deciding whether to use a glaze coat rather than a high-gloss enamel. The glaze is capable of providing protection as well as a more accurate historic appearance that includes a greater depth to the finish. These were not available until relatively recently and thus are not appropriate for replication of traditional finishes. Natural bristle brushes now have competition from synthetic brushes made of nylon or polyester which work well for applying either oil/alkyd or latex paints. Being harder than natural bristles, they tend to last longer. Since brushes come in a wide and very specific variety of types suited to different types of work, it is important to have a painter who will use the appropriate brush for the paint selected and for each portion of the job. One strong advantage of brushing paint on is that the paint is forced onto the surface and into all of its imperfections. Thus a good brushedon paint job may last longer if the substrate is sound and the primer and finish coats are compatible and of top quality. There is no harm in using a roller, or even an airless sprayer, to apply a prime coat to a large flat area. Since all contemporary commercial paints dry with a smooth surface anyway, use of a roller or sprayer is acceptable for priming, and even for a first finish coat. However, to get paint well pushed into articulated surfaces and to add some texture to larger flat surfaces, a brush is best. Oil-based/alkyd: Nonvolatile oils and resins, with thinners. (Alkyds are synthetic, gelatinous resins compounded from acids and alcohol.) Accept almost any type of coloring/hiding pigments. For use on interior wood and metal. Acrylic waterborne paints (latex): Suspension of acrylic or polyvinyl resins in water, with other resins, plus hiding and coloring pigments and extenders. Dries by evaporation. Commercially produced acrylic or latex enamels are also available in a complete range of gloss levels which are produced with the addition of various acrylic polymers. Use on interior plaster especially. Enamels: Modern alkyd paints are adjusted with the addition of synthetic varnishes to produce a complete range of gloss levels. Metal finishes: Paints marketed for use on metals, can either be alkyd, latex, or epoxy based, or combinations. The primers used for metals are formulated with rustinhibiting ingredients. Special finishes: finishes such as urethane and epoxy-based paints, marketed for very high gloss surface treatments. Finally, decorative paint work in an historic interior— whether simple or highstyle—is well worth preserving or restoring, and when such fancy work is being undertaken, traditional tools should always be used. To simplify by using shortcut methods or rejecting painted decoration is indeed to dismiss or skew history as well as to lose the enjoyment of a true historic finish. 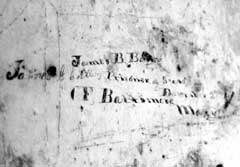 When discovered, important examples of history, such as this pencilled Civil War graffiti, should be preserved. Photo: Kaye Ellen Simonson. First, it is most important to understand the range of approaches and treatments and to make choices with as much knowledge of the original and subsequent historic paints as possible, using the Secretary of the Interior's Standards for the Treatment of Historic Properties as a framework. A paint's patina of age expresses decades or centuries of endurance in the face of changing climate and conditions. Documenting the sequence of interior paint layers and protecting this information for future investigation should be an integral part of any historic preservation project. Except for the rare, scholarly restorations of historic interiors, most repainting jobs done today will employ modern paint formulations. Modern paints can recreate the appearance of historic colors, gloss and texture in varying degrees, but eliminate earlier toxic components such as white lead and volatile organic compounds. Before undertaking any project involving paint removal, applicable State and Federal laws on lead paint abatement and disposal must be taken into account and carefully followed. State and Federal requirements may affect options available to owners on both paint removal and repainting. These laws, as well as any requirements prohibiting volatile organic compounds (VOCs), should be requested from the State Historic Preservation Officer in each State. Lead and other heavy metal compounds. In virtually all paints made before 1950, the white or "hiding" pigment was a lead compound, or more rarely, zinc oxide. 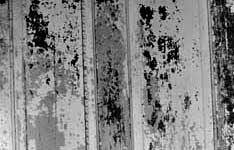 Work to remove lead paint such as scraping and dry sanding releases the lead—a highly damaging heavy metal—in dust. Lead dust then enters the human system through pores of the skin and through the lungs. The use of heat for stripping also creates toxic lead fumes which can be inhaled. To mitigate the hazards of lead paint ingestion, inhalation, or contact, it is extremely important to prevent the dust from circulating by masking room openings and removing all curtains, carpeting, and upholstered furniture. Drop cloths and masking containing lead dust should be carefully enclosed in tight plastic bags before removal. Workers and others in the room should wear High Efficiency Particulate Air (HEPA) filters for lead dust (fume filters if heat stripping is being used), change clothing just outside the room leaving the work clothes inside, and avoid any contact between bare skin (hands) and the paint being removed. Workers should also not eat, drink, or smoke where lead dust is present. Finally, anyone involved in lead paint removal should undergo periodic blood testing. After work, ordinary vacuuming is not enough to remove lead dust; special HEPA vacuums are essential. The surfaces of the room must also be given a final wash with a solution of trisodium phosphate and water, changing the washing solution often and rinsing well. In addition to lead, early oil paints also had cobalt or other heavy metal compounds in them to accelerate drying. A small amount of mercury is also included in some latex paints to help prevent mildew and mold formation. Organic paint strippers, such as methylene chloride, and oil/alkyd paints have VOCs as their solvent base. Inhaling these fumes can lead to respiratory and other illnesses, and to cancer. Especially in closed spaces (but in the outdoor environment as well) these compounds pollute the air and can damage health. 1500 Rhode Island Ave. N.W. Thanks go to the technical experts in the field who reviewed the draft manuscript and made substantive contributions: Andrea M. Gilmore (Director, Architectural Services, Society for the Preservation of New England Antiquities), Andy Ladygo (Jefferson's Poplar Forest), and Matthew J. Mosca, Historic Paint Research. Insightful comments were also offered by E. Blaine Cliver, Chief, Preservation Assistance Division. In addition, Technical Preservation Services Branch staff members (H. Ward Jandl, Chief) and the NPS Regions provided valuable suggestions on both content and organization. Kay D. Weeks, Preservation Assistance Division, served as director of this cooperative publication project and general editor. Clark, Victor S. History of Manufacturers in the United States Vol. III. New York: McGrawHill, 1929. Gettens, Rutherford J. and George L. Stout. Painting Materials: A Short Encyclopedia. New York: Dover Publications, 1966. MacDonald, Marylee. Preservation Briefs 21: Repairing Historic Flat Plaster—Walls and Ceilings. Washington, D.C.: National Park Service, U.S. Department of the Interior, 1989. Masury, John W. A Popular Treatise on the Art of House Painting: Plain and Decorative. New York: D. Appleton and Co.,. 1868. Weeks, Kay D. and David W. Look, AIA. Preservation Briefs 10: Exterior Paint Problems on Historic Woodwork. Washington, D.C.: National Park Service, U.S. Department of the Interior, 1982. Winkler, Gail Caskey and Roger W. Moss. Victorian Interior Decoration: American Interiors 1830-1900. New York: Henry Holt and Company, 1986.